Possibly motive behind killing on 88th & King Drive on Sunday morning (15 JUN 2008, 0435 hours)of a 23 year old man w/family who ran out of gas. I've gotten info from a very reliable source (business acquaintance of mine that works quite a bit with the Chicago police) that the 'car bump' gang initiations are beginning again in Chicago and may, in fact, spill over into the suburbs, as well. What happens is that, the wanna-be gang members will bump into the back of your car and if they can get the driver to step out of the car, that's the driver they decide to blow away right there on the spot; thereby, earning their way into the gang. So, if any young men or women rear end you, just take down their license plate and go to the police to file a report -- do not get out of or stop your car or even react -- just keep going. Please let everybody you know (men and women) about this. Spending $40 million for a campus expansion that was not requested while youth programs struggle to find a few bucks to pay the rent and weekly payroll. What gives? What If Kennedy had had to earn a living like most of us? If at my funeral someone were to say "He need not be idealized, or enlarged in death beyond what he was in life", which was what Ted Kennedy said at the funeral of Robert Kennedy, and which many are now writing about Ted Kennedy, I feel my journey on this earth would have been well served. I admire his contributions to public service, but I ask this, What would Ted Kennedy's life of service have looked like if he had had to earn money every day to feed his family, pay rent, etc? While I hoped that "those who have been given much, will give much in return" most of the people on this planet don't start out life with the understanding that we'll never need to worry about feeding our family, getting a job, paying rent, or having health insurance. Thus, the question I address everyday in my role of President of Cabrini Connections, Tutor/Mentor Connection, is "how do I and others, lead lives of service that earn us the type of epitaph given to Ted and Robert Kennedy" when so much of our daily effort is on filling basic needs, or even on survival? How can we connect those who live beyond poverty, with those who live in poverty, in actions that transform the lives of both? I think each person needs to answer this for themselves. Yet, finding solutions to the many challenges of the next century requires that not just the wealthy are doing great deeds. Hope and Despair in the American City: Why There Are No Bad Schools in Raleigh, by Gerald Grant, is a book that is being reviewed in a discussion on Fireside Learning. The book "is a compelling study of urban social policy that combines field research and historical narrative in lucid and engaging prose. The result is an ambitious portrait—sometimes disturbing, often inspiring—of two cities that exemplify our nation’s greatest educational challenges, as well as a passionate exploration of the potential for school reform that exists for our urban schools today." This is a discussion important to Chicago and most other cities in America. There are some interesting charts in this discussion on Fireside learning. How are we overcoming the fund raising challenges? Visit the Cabrini Connections, Tutor/Mentor Connection fund raising blog and see what we're doing and how you can help. Here's a message from one of our alumni showing his support. Hi my name is Michael Akins me and my three sister was a part of cabrini connections. I started in the small building when i was like in 5th grade. I met alot a great people and done alot of great things with the tutoring program. I am glad that i had the chance to experience everything that i did with the program from the dance group that i was in to the video production that i was a part of. Just saying thankyou to Dan,Gina and of course Jimmy who is no longer with us today. Read this article on Bradley Troast's blog, showing impact on the soft skills of the teens who participate in Cabrini Connections. Don Griesmann's report shows stories from around the country that illustrate how the economy is impacting non profit organizations. This is a Tsunami of epic proportions. Where are Bill Clinton, George Bush, and other leaders when we need them to be in the front lines calling for donations. Unless maps and databases like the T/MC offers, the funding generated by these leaders probably will only go to brand name organizations, not to the many smaller organizations doing good work in neighborhoods where few others operate. Just received an email from Mark Gesner at University of Wisconsin Parkside saying "It is with great excitement that I write to inform you that Mentor Kenosha & Racine (MKR) has been awarded a three-year $497,651 grant from the United States Office of Juvenile Justice and Delinquency Prevention (OJJDP). The grant supports MKR efforts to provide mentoring services for middle school students in the Racine and Kenosha Unified School Districts. " Read more. Mark and his team have taken part in the Tutor/Mentor Leadership and Networking Conferences for the past couple of years. You can find the workshop they presented in the agenda from the May 2009 conference. The next conference is November 19 and 20, 2009 and we hope that others who want to learn how to win grants, and build great tutor/mentor programs will attend and share your own ideas and strategies. 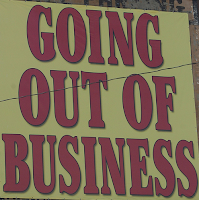 I saw an article in a business publication saying that 10,000 retail stores are expected to close in the coming year. This means these stores have not been able to attract enough shoppers to sell enough goods and services to cover their expenses. It means lots of people will be without jobs, and valuable retail services may be gone in many communities. If you apply that thinking to Cabrini Connections, Tutor/Mentor Connection, and similar small non profits who must attract donors every day to help pay the bills, how many of us do you think will disappear in the coming year? If we go out of business we put people out of work, but more importantly, we break the connection of hope and opportunity we've created with the inner-city kids that we work with. TRUST is one of the most important assets of any business, or of any tutor/mentor programs. If we can't continue our programs, we break the promise we've made to these kids, to help them through school and into their adult lives. Of course, not every tutoring and/or mentoring program has such a long-term vision, but we all connect kids and volunteers in various ways. If we cannot attract "paying customers" we'll be joining our retail brothers and sisters in the coming year. A lot of people involved with non-profits don't enjoy asking for money. But if you don't want this to happen, people need to be reaching out to friends, family, co-workers, frat brothers, and asking for donations for their favorite tutor/mentor program. So, why not make a donation today to Cabrini Connections, or another tutor/mentor program, today. 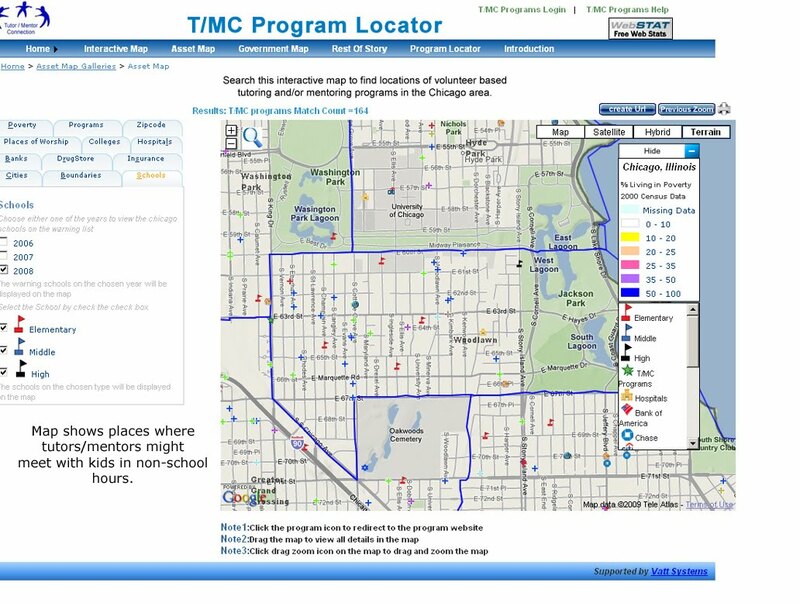 Mike Trakan wrote a new article on his blog to explain how others can use our maps to help tutor/mentor programs grow in different parts of Chicago. The map above is of the Woodlawn community area in Chicago. I created this to help the local schools and community leaders develop a strategy that would make volunteer-based tutoring/mentoring programs available to more kids in this area. At this point, we don't know of many non-school tutor/mentor programs in this area, and our database does not yet include school-based programs. Here's a pdf tutorial showing how to add or update information. We're trying to find donors to help us continue to fund this service. If you can help visit this link and make a donation or give us a call at 312-492-9614. What's Your Strategy for Helping Inner City Kids Move Through School and into Jobs? Every day we read something about violence, poverty, poorly performing schools, or about public officials not meeting the high (or low) expectations we have for them. How many of you spend time each week creating your own blueprint for changing some of the problems we face? 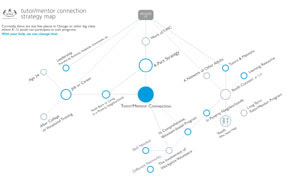 Above is a strategy map that you can find on the Tutor/Mentor Connection web site. If you'd like to review the animated version, click here. I'm not claiming this is the best strategy, but it is presented in quite a bit of detail. If you're mapping your own strategy to help kids to careers, please share it on your own web site or blog, and send me your link. I've been working on this for almost 20 years, since I lead a volunteer-based tutor/mentor program, and formed the T/MC in 1993 to help high-impact tutor/mentor programs operate in all parts of the Chicago region. I've never had much money to do this work. The most in any give year has been about $225,000. That's not much when you think we're talking about the third largest city in America. The Mayor spends more than that per year on public relations consultants. So, how do we expect to achieve this vision? We can't by ourselves. We can, as readers take this to their faith groups, civic groups, business and professional groups, and try to adopt the ideas as their own. Or they use this to stimulate their own creativity, and begin to publish their own strategy maps, on their own web sites. However, if you like what you're seeing, please send a donation to Cabrini Connections, Tutor/Mentor Connection, 800 W. Huron, Chicago, Il. 60642, so we can find a little more money to try to make this strategy work for Chicago's most disadvantaged kids. 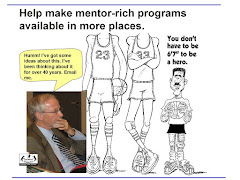 This is a graphic from the home page of the Tutor/Mentor Connection OHATS web site. I just wrote an article about this in my NICE Network blog. I hope you'll take a look. Gary Walters is one of those extra-special volunteers that we really need in every tutor/mentor program. He's now rollerblading from Brainerd, MN to Washington DC to raise awareness for Kinship mentoring, a program in the Minneapolis area. We've our own heroes. Nicole White and Nick Infusino are running in the Chicago Marathon, and asking friends and family to make donations to Cabrini Connections for each mile they run. They've already raised close to $500. Mike Trakin and I have launched another marathon, or "map-a-thon" aimed at raising money to fund the map-making that we do at the Tutor/Mentor Connection. This just launched and Mike and I have each put $25 in. We hope others will match our gifts, or even exceed them. Our goal is to raise $5,000 by October 15. With the economy having such a devastating impact on non profits, it's great to see people like Gary step forward to try to raise money for their cause. We hope others will do the same. This week the Chicago Tribune is focusing front page and feature articles on public schools since some have already started classes and others will start soon. Monday's feature was titled, "Troubled Schools, reforms tested again" and shows that wave after wave of reform efforts often have little impact. Charles Payne wrote about this in a book titled 'So much reform, so little change. The map created by the Tutor/Mentor Connection reinforces this. There were actually more schools added to the 2008 watch list than were removed from the 2007 list. Volunteer based tutor/mentor programs can expand this network of adults in the lives of kids. Some, like Cabrini Connections, Link Unlimited, Midtown, and East Village Youth Program, are building long-term connections that continue as the young people are moving into their adult lives. Building and sustaining these programs, so long-term connections can be created and continued takes many years of work, a dedicated set of leaders, and a dedicated core of donors. It takes the time and talent of many volunteers. So why isn't the Tribune, or the Secretary of Education, or the President, or the Mayor, calling on volunteers and donors to reach out over the next few weeks to join these programs? Why is everything focused on schools, and not the non-school hours. Why don't we say donate when we say volunteer? It costs money to provide the type of customer service and support that makes talented volunteers effective in these programs. It's probably because no one want to face this truth. We'd rather focus on Gold Medal Athletics than Gold Medal Youth Programs. We'd rather focus on getting elected, or re-elected, rather than really doing what's needed to surround kids with comprehensive systems of support. If we keep doing what we've been doing, we can be sure that we'll keep getting the same results we've been getting. This morning I attended a Literacy Roundtable, hosted by Jeanne Myers, Executive Director of Working in the Schools (WITS). The aim was to encourage programs to get to know each other, identify common challenges, then work in collaboration to overcome those challenges. In attendance were many programs listed in the Chicago Programs Library and who participate in Tutor/Mentor Conferences. There were also a few programs that I was not familiar with, since they focus on adult literacy, or deliver their services primarily in schools. Everyone was asked to share what they do and identify challenges. A majority listed lack of funding, and “too much to do with limited staff” as the primary challenge. Those working with Chicago Public Schools noted how difficult it was to get response from the Central Office and Administrators, and how it was more productive to work directly with teachers. Everyone agreed that this type of networking was valuable, and WITS suggested such events be held quarterly. I urged them to consider holding their November and May meetings within the Tutor/Mentor Conference structure, rather than creating a separate set of meetings at different places. The goal of the conference is not just to bring people together, but to build public awareness that draws volunteers and donors to tutor/mentor programs all over the city. As programs see this in their self-interest, we hope more will become strategically involved with the conference and activities around the conference that increase visibility for tutor/mentor programs. One leader suggested creating a new web site with listings and links for all of the literacy programs in Chicago. I encouraged them to first see if they were listed in the T/MC library, and were using it for collaboration, before they create a new web site that someone would need to manage on a regular basis to keep the data up-to-date as we do at the T/MC. One leader noted that for people to be motivated to keep coming to meeting like this the group would need to “expand the resource pie” so that everyone would get some tangible funding relief as a result of their participation. I’ve posted a graphic that is in one of the presentations on the Tutor/Mentor Institute web site. It illustrates the many funding choices the people and organizations make. Our goal is that every business and foundation in the Chicago region (and the country) has a slice of their donation pie dedicated to volunteer-based tutor/mentor programs like the ones many of us lead, and that they are taking leadership roles that encourage employees, retirees and customers to provide time, talent and dollars to support programs within the tutor/mentor category. I ended my comments by urging each program to use their own communications ability to share information about this meeting, and to help educate donors on why they should fund volunteer-based tutor/mentor programs. Imagine if 25 or 50 tutor/mentor programs in Chicago were using blogs, facebook, Ning and other forums with the same purpose and vision that I write this blog. We talked about meeting again and I encouraged leaders to use the Internet to connect with each other. I think face-to-face meetings are important, but it's difficult to get all of the right people into a set of on-going meetings. With the Internet, anyone can be part of the meeting, regardless of where they are in the world. I believe we have a lot of room to grow in this area. I think many of the non-profit tutor/mentor program leaders in Chicago, and many of the business and foundation leaders we want to connect with, are not actively using the internet for learning, collaboration and capacity building. I say that just because I don't find many forums where there is active participation of other tutor/mentor programs from Chicago, or of those who would benefit if such programs were having a greater impact in helping kids through school and into jobs. This is a challenge to all of us. What good is all of this information if high level city, state and national leaders are not spending a few hours each week browsing web sites to learn directly from the ideas that are available to them. Having someone on your staff tell you about what they read on a web site is not the same thing as looking at that information with your own eyeballs. If we want kids to learn to use this resource, we need to find ways that our adults, and older generation of leaders, are finding time to explore it themselves. If you attended today’s meeting, or share the same concerns, why not write about it on a blog, or on Facebook. Why not join in on-line discussions to share more about what you do, and what you feel you and others can do to increase the size of the pie, so all of us have the resources needed to help kids succeed in school and in life. If you're already doing this, please share your link and we'll try to give you attention from our own blog and web site, just as I have by putting links to programs in this blog. I've written several articles in the past about the role of "talent volunteers" in a non profit organization. I was please today that my friends at WomenOnCall.org pointed me to an article on the Stanford Social Innovation Review, titled "The New Volunteer Workforce". As we head toward the start of a new school year, and deal with a crippling economy, this article has a lot of value. I encourage you to also read the comments. One was written by Bonnie Hilory, Executive Director, Haas Foundation. She talks about "the care and feeding of the volunteers." She says, "As our volunteer program grows we need to educate our board, donors and volunteers that more funding will be needed. The more volunteers we have the more financial support/help from the agency we will need." How about educating the businesses who encourage employees and customers to volunteer? If a company encourages volunteerism, can it also encourage workplace giving that supports places where employees volunteer, or develop some other innovative strategies that provide the dollars and manpower needed to support volunteer involvement in all of the ways the Stanford article suggests? Furthermore, how about giving employees more choice at where they volunteer. I met with one company official last year after the announcement of a $50 million corporate commitment to encourage talent volunteering. They had already made up their corporate mind as to where such volunteering would take place, thus limiting the number of volunteers who could get involved, or who might want to get involved with that cause. 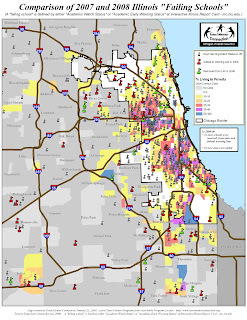 If companies would point to maps of cities like Chicago, showing where tutor/mentor programs are needed, and providing contact information and web links for existing programs, their employees could choose where to volunteer time and talent, and where they also might provide dollars. 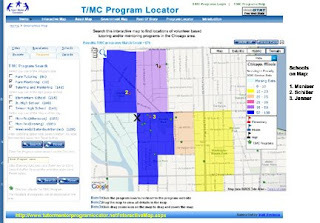 The Tutor/Mentor Program Locator can be used for companies in Chicago who want to provide this range of opportunities. There are close to 200,000 kids living in high poverty neighborhoods in Chicago. Connecting them to tutors/mentors in constantly improving tutor/mentor programs is a way to help them succeed in school and in life. Providing talent and dollars from local corporations, hospitals, universities and professional groups is a way to help make such programs more available throughout the city and suburbs. Organizations who submitted proposals for mentoring grants as part of the American Recovery and Reinvestment Act of 2009 (Recovery Act)are now beginning to be notified. Here's a link to the announcement list. Over the next six weeks we'll see how many winners there were among the hundreds (thousands) of organizations who spent tremendous time, dollars and emotional energy writing these grant proposals in July. 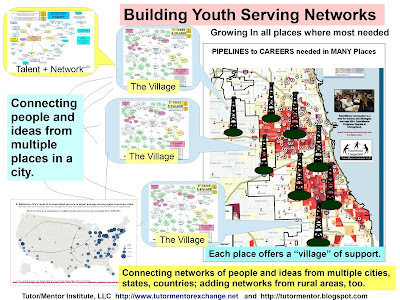 I know that the Tutor/Mentor Connection was included as a resource in three Chicago area proposals. After the dust settles, I encourage everyone to look at the poverty and school performance map of Chicago, or any other big city. Have we provided funds into all of the neighborhoods that need tutor/mentor programs? Have we provided stimulus dollars to keep small programs from cutting staff, or closing operations? I suspect that's not the case. Facilitate this understanding so it leads to a more consistent flow of volunteers and donors to all of the tutor/mentor programs in the city, while helping each program constantly improve their own efforts to keep kids and volunteers connected. Our Theory of Change is that if we take this role, more people will use the information to help good programs grow in every poverty neighborhood. We've been documenting what we do to achieve those goals since 2000 and this chart shows that we've done close to 1000 actions intended to increase visibility, while we've documented over 600 actions that help people understand and use the information. You see similar charts at T/MC OHATS . Viewing this works best in Internet Explorer. We've never had much money to do this work, yet, we've done what we can each year. Imagine if there were hundreds of leaders in business, faith groups, government, philanthropy, etc. with the same four goals, and who were using this system to document actions they were taking each day to help kids in poverty move to careers. 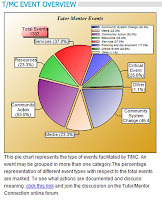 Visit the T/MC OHATS and look at the metrics charts. If you want to log in and read some of what we've documented, and see how the system works, you can log in using GUEST as the username and VISITOR as the password. If you want to become a partner to the T/MC, and record your own actions toward these goals, we'd be happy to add you as a recorder. That's the aim of this system. We can't achieve these goals if it's just me and my small organization doing this. We won't know what we've all accomplished if we don't have some sort of documentation system to tract the impact of collective actions over many years. If you think this is valuable, and that the T/MC is providing a needed service, we'd appreciate your financial support. Learning from others - Fund Raising, Leadership, etc. I wish I had 30 hours in a day, or did not need 8 hours of sleep each night. I'd use the extra time to follow links on the T/MC blog and learn from the vast amount of expertise being freely shared by others. Last night I was up late because of a radio show I was on at 12:15 am. I spent the time updating the blog links on the T/MC site, and reading some of the blogs which are on the blog roll of the Give & Take Blog of the Chronicle of Philanthropy. Since I was not familiar with most of the blogs listed on the Give & Take site, I started at the bottom and moved up the list, opening each site, and reading a bit about what they offered. I could earn a PhD if I could do this more often. We could pack 100 hours into each 24 hour day, if I could motivate my volunteers, board members and supporters to spend just one hour a week reading and learning from some of these writers. Plus, on most of these blogs, they have their own links and blog role. It's a resource that keeps on expanding. This incident only received small coverage in today's Chicago SunTimes. It was at the top of page 15. The shooting took place in the 11000 block of South Normal, on the far South Side of Chicago. That's far from the hub of media attention focused around the LOOP and North Side of the city. Yet, if you look at this map, the commuter route, bringing people from Indiana and the South Suburbs to work in the city every day, passes on both sides of this neighborhood. If we want to help end this violence, we need to get people personally connected with programs serving youth in the area, and there are two or three to contact (the green stars on our map). We also need to get people in the downtown office buildings talking about this, and talking about ways to help build Gold Medal tutor/mentor programs in areas where there is too much violence, and too many poorly performing schools, as well as people attending religious institutions and colleges in the communities on the other end of these access routes. 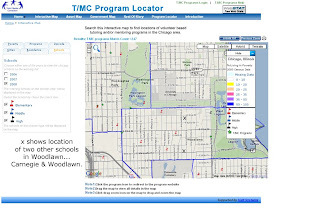 These maps and the program locator are provided by the Tutor/Mentor Connection, a non profit organization. This is a free service, made possible by donations from corporations, foundations and individuals. If you want to help us keep this service available, please consider a donation. Poverty Map Not Changed Much in 15 years. Why? I've been clipping newspaper stories from the Chicago Tribune and Chicago SunTimes for about 15 years. I keep a file on these, and use them to remind me of why I created Cabrini Connections, Tutor/Mentor Connection. This was the front page of the Chicago Tribune in 1994, telling us that "Chicago can be a cruel place in which to grow up." 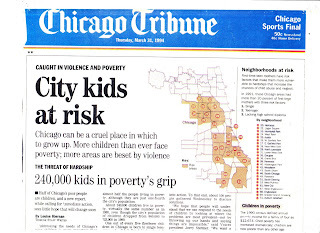 According to this article, 240,000 kids were living in poverty's grip in Chicago. 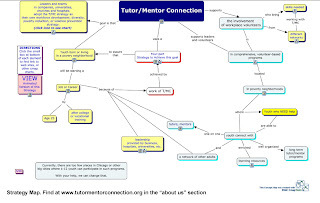 This is a map the Tutor/Mentor Connection created in 2009. It shows that poverty is still concentrated in pretty much the same neighborhoods. 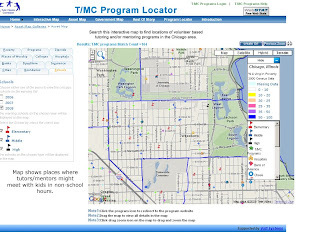 You can see more maps like this in the T/MC map gallery and you can build your own neighborhood analysis using the Tutor/Mentor Interactive Program Locator. So why has there been so little change in 16 years. Has there been consistent leadership from business, faith groups, politicians and media? There certainly has been a ton of money spent, but has it landed consistently, from year to year, in the same neighborhoods, and the same organizations? High turnover in schools and social service agencies means there's a limited accumulation of "human capital" or experiences, which are essential to building better schools, and better tutor/mentor programs. El Da'Sheon Nix leads our Cabrini Connections program. He's a former football player so he uses sports apologies to talk about the team on the field (tutors, mentors staff) and the fans in the stands, and investors, who provide the money so a top quality team is on the field. This article is a recent post, where he and other Northwestern University alumni talk about "motivation". We're in the 2nd week of August. What are leaders doing to motivate people in their networks to become volunteers and donors in tutor/mentor programs? Anyone can take this leader role, using social networks and face-to-face networking to encourage others to read this article, or to use the Program Locator to search for a place in Chicago to be a volunteer or a donor. Until thousands of people say "If it is to be, it is up to me" we'll continue to be a "cruel place in which kids grow up." Connecting those who can help with those who need help. Over the weekend I wrote an article pointing to a column written by Mary Mitchell in the SunTimes. She wrote, "We Want Youths Off the Street, but Won't Pay for Positive Activities"
Cabrini Connections offers such positive activities, and I sent an email today to about 1300 of our stakeholders, asking them to make donations to help us pay the bills. My background is in history and corporate retail advertising. If you browse our sites you'll see this reflected in how I work. I collect information that shows where and why tutor/mentor programs are needed, and I tell stories showing how kids and volunteers are connecting at Cabrini Connections and in other places. My email list of 1300 people is just a dot of sand in an ocean of nearly 11 million people who live in the Chicago region and read stories related to poverty and poorly performing schools every day. There must be thousands of people, rich and not so rich, who might invest dollars, and time, in the work we're doing, if they just knew we existed and were motivated to do something today to help us. When I was with Montgomery Ward I had a $250 million budget to draw customers every day to 400 stores in 40 states. We had three waves of print ads going weekly to almost 20 million people, just reminding them that we had stoves, tires, jeans and other things they might be looking for, at prices they could afford to pay. I don't have $250 million to draw volunteers and donors to Cabrini Connections and other tutor/mentor programs. Now I only have my blog, web site, and social networking sites, plus an army of volunteers. If you care about the future of kids living in poverty and think that connecting them to an expanded adult network is a benefit, to the kids, and to the volunteers, help me spread this story through your networks so that the people who have the ability to help us, and want the same outcomes that we seek, will find us, and invest in our future and the future of the kids we're working with. Mary Mitchell's column in the Sunday Chicago SunTimes talks about how the highly regarded Simon HS baseball team is playing on a ragged, dirt field. She writes "We want young people off the street. But we don't want to spend the money it takes to keep them engaged in positive activities." As she says "This goes to the heart of our youth problem." We can't have effective, volunteer-based tutor/mentor programs operating in neighborhoods all over the city if we can't innovate ways to point revenue on a consistent based to each of those programs. One way to do this would be for company leaders to build the Tutor/Mentor Program Locator into their workplace fund raising campaign. Encourage employees to search our database of programs, pick ones they want to fund, and designate them for their weekly payroll deduction contribution. Another way would be for faith groups in affluent areas to designate 10% of what they collect each week into a fund that provides operating dollars to tutor/mentor programs in high poverty areas. I'm sure there are other strategies that would be just as good. I hope that people reading Ms. Mitchell's column today will put some time into thinking of ways they can help provide the money. Crime down in Chicago. What about shootings? What's the rest of the story? Today's Chicago SunTimes re[prts that the Murder Rate is Falling . That's good news, but does it tell the whole story? Carol Marin wrote a column last week saying, Homicides may be down in Chicago, but shootings are up. There's not a lot of good data on how many shootings there are. No good records on who was shot. Even fewer good records on who was "shot at" but missed. What's the impact of this? The SunTimes ran a series last year titled, "Schooled in Fear" showing the impact of violence on the learning abilities of inner city kids. 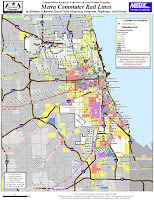 We created this maps, and others, showing the schools and neighborhoods featured in the Sun Times Story. I attended a meeting in the Woodlawn area yesterday, where faith leaders, University of Chicago leaders and the principles of the nine elementary schools in the Woodlawn area met to discuss setting up a tutoring program at each school in the neighborhood. This was part of a larger vision called the Woodlawn Children's Zone, which is modeled after the highly visible Harlem Children's Zone. Below is a map of the Woodlawn areas, created using the Tutor/Mentor Program Locator. In my meeting yesterday I heard Bishop Arthur Brazier of the Apostolic Church of God, talk of a strategy that reaches all youth in the Woodlawn area, not just a few in a few pilot programs. This is exciting news. If the University and the faith community use their resources to support the growth of school-based and non school tutoring and mentoring throughout the Woodlawn area, creating a pipeline of programs that reach youth from K-16, and provide mentoring and enrichment and character development, as well as tutoring and learning support, they are well on their way to combating the impact of violence, drugs and other negatives working against children growing up in Chicago. I hope the media help them by pointing to tutor/mentor programs on a weekly basis. I encourage you to read the commentary in the Chicago SunTimes and the Chicago Tribune, showing the many perspectives and experiences Judge Sotomayor will bring to the Supreme Court. I'm pleased with this appointment because it provides one more role model for youth living in high poverty and minority neighborhoods to aspire to. In fact, it's an example for all youth in America. Sotomayor's success shows that hard work can pay off. Kids need to learn that. Role models need to model this message over and over. The goal of programs like Cabrini Connections is to connect kids in poverty, who don't have these success mentors in their family, neighborhood, church or school, with volunteers mentors who have a history of success in work, education, and life. If you can be a mentor, or can provide financial support to a program like Cabrini Connections, so others can be mentors, act now so that as school starts more kids will have role models helping to create the next Obama, or Sotomayor. Read the program profiles on Nicole's blog to see other programs beyond Cabrini Connections where your involvement is needed. While school does not start for another few weeks, and mentors and tutors may not be matched with kids until mid September, now is a good time for volunteers and leaders to be doing their own learning, so they are better prepared to be a mentor and tutor this coming school year. Here are some links to sections of our web site, which have links to other web sites where you can build your skills. This last link is important because we point to tutor/mentor programs and support networks in other parts of the country, not just Chicago. If leaders and volunteers learn to benchmark what they do in their own program with what others do in their programs, you can begin to see opportunities for constant improvement. If someone else is doing something that seems to work, why not try to implement it in your own program. If someone else has great training materials on their own site, why not use these for your own volunteer learning. Here's an example. I lead the Cabrini Connections tutor/mentor program in Chicago. On our web site we provide information to coach our own students and volunteers. Some of this is reference material, such as volunteer handbooks and procedures. Some of it is weekly coaching, such as our email newsletter. 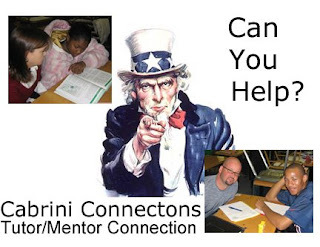 If you're operating a tutor/mentor program with the same goals as Cabrini Connections, you could coach your own volunteers using the material we post every week on our own site. If you look at dozens of web sites of other programs, you will have an even wider range of information to draw from in making your program the best in your city, and in the country. When a youth joins Cabrini Connections at 7th or 8th grade, we say "we'll do everything we can to assure that you're starting a job, and career, by age 25". We show this on our web site. We also say, "We're only limited by how much our volunteers, donors, and the kids themselves, are willing to do to make this happen." I use graphics, like this one, to illustrate this commitment. If kids are in 7th grade today we need to provide six years of consistent support, just to help the finish high school. Then, it will take another 4 to 6 years before they are nearing age 25. This could be after finishing college, or serving in the army. It could also be after spending time in jail. A wealthy person asked me once, "when do we quit?" He had led one of these programs where donors promise college money for kids who make it through high school. His kids were seniors, not ready for college, when he asked me this question. I said, "If they were your kids, when would you quit?" Today I was pointed to an article in the Wall Street Journal, showing how teacher's unions often work to the disadvantage of students as they promote the interests of teachers. I used an image of the Marine Corps War Memorial with this article. That photo conveys the idea of men and women sacrificing everything for their country. How much are our volunteers, donors, teachers and other leaders willing to sacrifice to help inner city kids move through school and into jobs and careers? I'm constantly reaching out to find donors to help me pay the bills. If donors want the same goals as me, what keeps them from looking at my web sites, or those of other tutor/mentor programs (see list) , and basing their giving decision on what they see on the web site? Every August school starts and for the next six years Cabrini Connections needs to be here, if the 7th graders entering this fall are to have tutor/mentor support from us until they are seniors. We'll be here if enough donors find us and share our commitment through their role as the banker for this work. High school kids share ideas on fighting youth violence. In another email today I was pointed to a CIM, which is a web based Community Issues Management System, intended to facilitate community collaboration and problem solving. This presentation shows the power of such a system. If the kids are saying they need more role models, and family support, and ways to combat peer pressure and gangs, the community collaboration should be identifying what neighborhoods have places which offer such support, and what strategies would help create additional places where no support is now available. Furthermore, a CIM would be building commitment to the funding and other resources needed in all of these places to reach kids as early as elementary school (one of the recommendations) and stay connected to these kids all the way through high school. Be nice to have such a system in Chicago. The resources provided by the Tutor/Mentor Connection could be useful to such a collaboration. Driver shot in Cabrini Green - near Police Station! This story about a shooting that took place on the Near North Side did not seem to get much attention last week. I used the Tutor/Mentor Program Locator to create this map, then edited it with Adobe Photoshop to show where the shooting took place (X). This is actually right in front of the Chicago Police Department station on Larrabee. It's a tragedy. Another one. I wonder why this one did not get the media attention that other shootings in Cabrini-Green have attracted in the past. Following another week of shootings, this one claiming a graduate of the Ariel Education Initiative, which Arne Duncan helped start, the US Education Secretary says "Our children deserve better. We as adults are failing our kids and the community at a level people don't begin to understand. " Read the full story in the Chicago SunTimes. Let's think about that statement "at a level people don't begin to understand". I've been promoting volunteer-based tutoring/mentoring because it brings people beyond poverty into direct, and on-going, contact with kids and the issues of poverty. If Duncan and other leaders were encouraging this type of involvement in programs all over the city, and encouraging business and foundations to provide the operating dollars for each program to have experienced, dedicated staff who "make a long term commitment to these kids", we might be able to build the type of understanding that could lead to new forms of support for inner city kids. Duncan promised me his support a few years ago, prior to taking over for Paul Vallas. I give him an 'F' for the level of support he has provided the Tutor/Mentor Connection, and volunteer-based tutor/mentor programs in Chicago. That can change. It needs to change. However, leadership and support for tutor/mentor programs is not dependent on Arne Duncan, or President Obama. It's up to each of us. Anyone can be the type of leaders who mobilizes volunteers and donors to support tutor/mentor programs in Chicago. Anyone can point to the Tutor/Mentor Program Locator and encourage people to get involved.